We lost a "wonderful" member. One that told that he has no idea about a boss after he wiped us on it. No, we did not kick him. Then why did he left? Maybe he was lying about being in the hospital. But maybe he was telling the truth. Maybe something out of his control stopped him from coming. If it wasn't his fault, shouldn't we wait for him? Definitely not. My interest is to raid. If you can't make it in time, too bad, someone else will come. It is maybe not your fault, but nor mine. What our lovely specimen did not notice is that the damage was done and someone had to bear it. He expected us to do it. Well, we won't. Socials might would. Then go and enjoy their company. But when you are waiting for them or when they do below the tank due to "low gear lol", don't forget that they use the very same reasoning: "it's not my fault, others shall bear it". Taking responsibility for your life is a crucial step in being a mature person, everyone knows that. But there is no recipe how to do it. There is a simple way for that among goblins: you will take responsibility for your life, simply because no one else will. No one will help you out, no one will carry you, no one will say "it's not your fault". At best you get "bad luck dude, will be better next time". When will it be better? When you make it better. It's your life after all, who else could make it better?! Late is late. If your late without asking and being granted leave, and there are 10 suitable players available - then you miss out. If you miss out; organise another run (or join a /trade pug) and be organised next week. There is nothing worse than someone who signs up for a raid and then doesn't show up/is late, even in social guilds. It sets a precedent that inevitably leads to the raid time going from 9pm to 9:15 to 9:30 to no longer raiding on Thursdays, etc. Having said that... "I thought you was a good guildleader that waits for there people?" How long has he been a member of your guild? 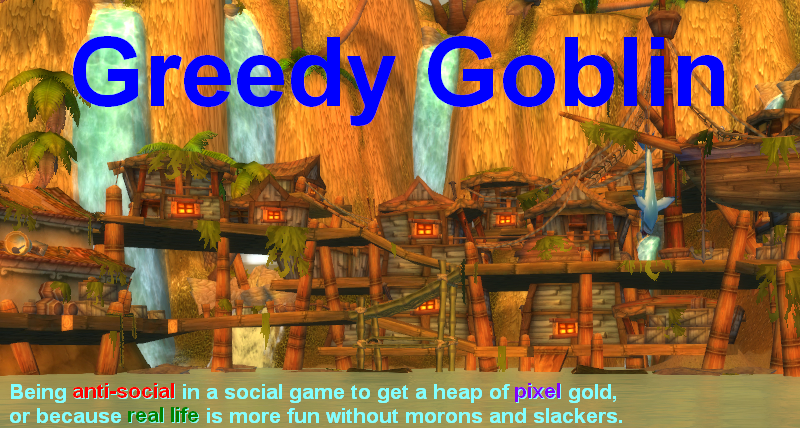 Or do you perhaps behave differently in-game than in your blog posts? I agree with the decision that you didn't wait for him/her, but considering he told you that he was in the hospital, you could be a bit nicer. Probably he was in a mood, having any business in the hospital means there's a high chance that something is fucked up in your life. You kinda provoked him with your style, when he had to find something or someone to blame. You could've shown some sympathy for him, explaining him kind but firm why didn't you wait. Instead you went your usual cocky style, which lead to this situation. The pug is specifcally designed to be able to avoid having to wait on late people which is one of it's best traits. People like him are the bane of typical fixed roster guilds and more progression oriented guilds would simply kick him. It would be different if there was some sort of time allowance for people who signed up but there isn't. He's wrong, your right. The part where you talk about taking responsibility for your life is good. He should have known that late is late. It's not like it removes him from the pool for the next raid. He can get his chance again 100% sure. Why cry for once? Go do other stuff! Also indeed, IRL>WOW. Where did you get this guy? A brain damaged horse would type better than him. It would be nice, in my opinion, to have more rational posts like this, rather than clumsy, somewhat fallacious conclusions. I don't understand the problem. All he has to do is say, "Sorry I was late", and then show up for the next raid he signed up for. If I was late, I would be glad they went ahead without me and didn't waste any extra time. The only reasonable approach is to say be punctual or we will take the next best option. Not only did the PuG just go on, there weren't any hard feelings. I don't get the impression that you would exclude him next week, nor do I get the impression that you were angry with him. RL came up, so, hey, no problem. We go on. I wonder if he knows how rare that really is in a guild? I agree that if you are late there is nothing wrong in getting replaced. Still even responsible people sometimes have to prioritize other things before their sign-ups, and losing a good, responsible player due to lack of flexibility is not a good thing, especially when the replacement might be worth 10 minutes at the beginning when you do trash and his contribute might be irrelevant, and a few wipes afterwards which will net you a loss overall. We punish being late with less DKP (you can do the same with a fine inf gold to be shared among the raid) and also with replacement, but this tends to happen only once the trash is done, which gives another 5-10 minutes to the late player to arrive. The best way is to strike a similar balance, so that being late is strongly discouraged but an actual replacement is done when is actually required. Still this requires more rules (defining the fine and when replacement would actually take place) so it's understandable if a simpler rule is better for the PuG. There is no need for sympathy here. If he really was in the hospital, raiding kinda pales in comparison. I think he should be more concerned about his own health and well being than whining about missing a raid invite. The fact that this (ex-)guild member threw up such a fuss only leads me to believe the excuse was complete BS. And once you let it happen once, it will keep happening over and over as other guildies see it occur. If this fellow was in the hospital - why does he care so much about the raid? As Shakespeare wrote, "he doth protest too much". A good leader uses social skill to manipulate his peers into preferred behavior. Showing empathy is one of these skills, but since in The PuG it is very business-like and something like empathy leads to social behavior which -using Gevlon's words- makes people into social apes I can very much understand Gevlon's reply and in the context of The PuG I find it appropriate. You also have to consider that he is lying about hospital. If his hospital visit was really that bad perhaps his mind wasn't on a raid even if he was late. Has this ever occurred to you? Because if you are raid leading, especially without trusted peers, you stumble upon this type of player. The one who comes up with excuses. Which is precisely what he started to do later on in the conversation. By the way being firm and showing empathy are not mutually exclusive. The best raids, the best encounters I had was with firm raid leaders who were able to show empathy (or act they did), delegated responsibility, were able to laugh and take a joke but also be serious when required. Many raid leaders are only able to do one of these: be very serious, stoic, and boring or being an utter joke nobody takes serious. I actually find him to be rude. He knew he was late and he knew he might be replaced because of this. To me, the polite thing would be to apologize for being late and then explain you were "at the hospital" or whatever was holding you up. I do find it amusing that he expected you to somehow know why he was late and to wait on him (like you are psychic), but that he thinks it too much that he should have had the same psychic ability to know he would be in hospital! You also spent from 19:11 to 19:22 chatting back and forth in grade school style (did so, oh huh, your mama) likely also wasting some of the raid's time. Are you baiting people to make them an example (or a blog post)? Not only is that social, it's dysfunctionally social. @herites: Sure, that would have been the nice thing to do and some people are nice. I think being nicer about it would be a commendable thing to do, but I wouldn't hold it against anyone if they didn't. To be honest (and this is defniitely not being nice about it, I admit), if you can come home from the hospital and still find time to log on and raid, either your life isn't all screwed up, or your priorities are. I remember that first time after I 'woke up' after motorcycle crash, was picking up the bike from the street, then logging to WoW via mobile app, and informing them that Im waiting for ambulance and I wont be there for next two days. Wasn't that the guy who's first line in the guild was 'tv m8'? Guys, you forget that one of his relatives could be in hospital, and he got kicked out after visitor's time is over, or he was on diagnostics, for cancer for example. In both cases you could go home, and could raid, without screwing up your priorities. I don't want to defend his tantrum though. Looks like someone got complacent in the guild and felt like they were "needed." I guess the next question Gevlon is to ask yourself how this sense of entitlement happened within the guild to ensure it doesn't happen again? Seriously, I've never had a valuable player approach being late to a raid like that. Hands down, the person you like to raid with logs in and says, "Man, I'm so sorry I was late - I was at the hospital and couldn't get word to you. I'm so happy you found someone to take the spot." The guy started the conversation in a jerk way, and Gevlon responded to his tone. In my experience the people who approach this issue in this manner are always the people who want the group to be responsible for their playing, rather than considering the group. I don't always see eye to eye with Gevlon, but I have nothing but sympathy for his reaction to this guy. About taking responsibility for your actions. Back in WotLK my guild was at LK and my PC was crashing constantly every attempt. I wasn't wiping the raid, but I was useless, and so I decided to let someone else take my place. LK died in about 30 minutes after that and it was the only time I missed first kill in guild. It took my guild several more weeks to repeat it and I was really pissed by how badly people performed after the kill, but I'm glad I wasn't the one to be blamed for not being able to focus for 10 minutes. It's not that 10 minutes is too much. It's that when you are late, usually no one knows if you will arrive at all and how much they have to wait. Thus every guild that is at least a bit serious about raiding WILL NOT wait for a missing member if he has any substitute for that spot. Gevlon was definitely in the right. One of my pet hates happens to be players that sign up but don’t attend or are late. Makes my blood boil when 9 or 24 of us are sat at our PC’s twiddling our thumbs waiting for one selfish person. The hospital excuse has been done too many times. Frankly I don’t believe it. They choose the hospital excuse because they know you will be afraid to question/punish them due to the 0.001% chance that they actually have been at the hospital. Anyway it is true that RL > WoW. You lose your spot that night but face no further punishment such as DKP deduction so what’s the problem? Sounds fair to me. If you can’t raid to the schedule then don’t raid. This is the reason I quit raiding and now play casually. I have mixed views on Gevlons asocial guild system but in this case his guild has a advantage over the casual/social guild I play in. Our leaders behave socially towards those pulling the hospital excuse and this in turn allows the slackers to get away with behaving antisocially towards the rest of us. I suppose Gevlons asocial guild is in that sense more social than social guilds. If you understand what I am saying. Dumb thing to say. You wasted both your times by inciting him with those words: surely you expected a negative response. Depending on his ability and other qualities, you may have also wasted a valuable resource. It would have been more efficient to simply reiterate why he was left behind and that he could make it to the next raid. In five years of casual / social raiding, I have never seen anyone make such an absurd argument. Raid time is raid time. If you aren't on-line, and someone else is, then they get an invite and you don't. Happens all the time, and nobody thinks anything of it. This is another data point supporting my hypothesis that most members of The PuG are not cold-blooded materialist goblins, but rather Gevlon fanboys who expect him to carry them to success. As long as you are fair and consistant. If you are late you need to excuse yourself, etc. The key here is consistancy. Make everyone abide by the rules. Right decision, wrong way of handling it. All Gevlon had to say was "Not your fault. Better luck next week." He'd have wasted less time on a stupid conversation, the raider wouldn't have left, and you can bet Scantraxx would have been *early* next week. The people I used* to raid with, that raided to be with their friends, wouldn't wait 15min for people to turn up if we had a full raid ready to go. That said, their buddies would let them know if they were going to be late and would usually say "I'll be late, I should sit out this week." Most people that don't want others to bear their burdens understand this. Noone should be putting up with people that insist you wait for them and carry them and put up with them. *stopped raiding with them because my schedule changed irl. @ Mittenz, exactly. But that is with friends. In my guild people have each other's contact info (phone number) in case of emergency. I can't imagine that happen in a PuG tho. Consistency indeed is important. Imagine you PuG and some fellow fucks something badly up. He should receive a big fat warning, next time kick. Because if you don't aggressively act against such moronic move others will start slacking too. I'm amazed the conversation went that far. If raid starts at 9 PM, and you're not online, you're getting replaced. Exceptions made when you let me know beforehand. If someone unleashed that ridiculous whine on me they'd be permanently banned from raiding.